We offer a wide range of ESD Tapes & Labels that offers total solutions for the static control environment construction needs. These are designed with latest technology that ensures superior performance. 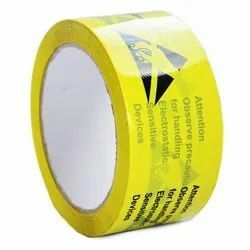 We offer Conductive Grid Tape, Antistatic Tape, Conductive Tape, EPA Warning Tape, Masking Tape, Electrical Tape for Electronic Industries, Lane Marking Tape, Conductive Strapping Band, ESD Labels and ESD Posters. Backed by our rich industrial experience and robust infrastructure facility, we have manufactured a wide range of Floor Marking Tapes that are widely used as lane marking, section segregating, color-coding, hazard warning labeling, sealing and identifying.